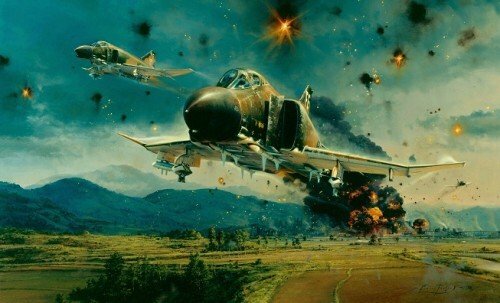 Internationally hailed as one of the finest air combat scenes of the Vietnam War, Phantom Strike portrays the aftermath of the attack. With the infamous ‘Thud Ridge’ in the background, the air is alive with shell bursts and tracer fire as the three-ship strike force hurtles through the concentrated onslaught of flak. Behind them the steel mill billows flame and smoke. Thanks to the Giclée process, collectors can now complement those high value signed prints with the release of these Studio Proofs. Exclusively limited to just SEVENTY FIVE copies worldwide, each canvas Giclée is stamped on the back, hand-numbered and issued with a Certificate of Authenticity.